Diabetes Week - Why is Research Important? | Life, Sport and Diabetes - An everyday look at my life with type 1 diabetes. Diabetes Week - Why is Research Important? Sometimes you might question whether or not research into diabetes is important. Many people are very happy with the diabetes treatment that they currently receive, whether that be people with Type 1 diabetes doing their insulin injections numerous times a day. Or people with Type 2 diabetes taking their Metformin tablets for example. But what if I told you that if you had diabetes less than 100 years ago the prognosis for someone with diabetes would not be good at all. Or what if you had been diagnosed with diabetes a few decades later, but the only 'treatment' available to you would be that you lived on a carbohydrate free, protein diet? And the reason why these are not the treatments we still follow today? New and much better ones were developed and pioneered through research. In the last 85 years the prognosis for people with diabetes has changed immeasurably for the better, thanks to the research into topics such as how the pancreas behaves, how insulin effects the body, how diabetes can be treated and how we can reduce tricky effects such as long term complications. Recently there was a study conducted into diabetes control and complications that was a trial. The results of which can now provide the information on how to maintain near normal (in comparison to somebody without the condition) blood glucose control, and in doing so can lower the risk of long term complications by up to 75%. The life expectancy of people with diabetes has increased dramatically over the years. The journal of diabetology suggests that in 1897 the average life expectancy for a 10 year old child diagnosed with diabetes was just 1 year. Diagnosis at the age of the 30 carried a life expectancy of 4 years, whilst a 50 year old newly diagnoses person with diabetes could expect to live only 8 more years. But by 1945, a newly diagnosed 10 year old then had a life expectancy of 45 years, a 30 year old more than 30 more years and a 50 year old 15 years or more. They claim that although today's life expectancy for someone with diabetes is now 15 years or so less than someone without the condition. The prognosis is still years better. But what happened between 1897 and 1945 to make such a vast improvement in the life expectancy of people with diabetes?... Research. 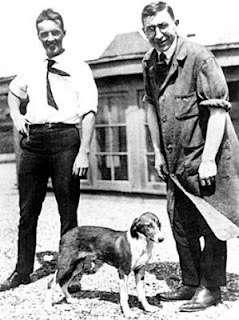 That then inspired the research of Osker Minkowski and Joseph Von Mering who during their studies into diabetes decided to remove the pancreas' out of dogs in order to discover if it effected blood glucose levels. It did and the dogs started showing symptoms such as increased thirst, weight loss and excessive urination. Thus discovering the relationship of the pancreas' role in diabetes. In 1921 doctors Banting and Best discovered how to extract insulin from the pancreas of animals without damaging it and started administering it to patients. Which began a process that will still continue today known as insulin therapy. Before doing the research for this blog I knew that my insulin treatment was thanks to pioneering scientists just a couple of decades ago and their developments into diabetes. On a personal level I know that Humalog, the analogue insulin that I use in my insulin pump was the first to be discovered of its kind. But I can't imagine what the scientists who made the insulin would make of the way it now goes into a machine that administers it every 3 minutes. But this is how research works, that one group of scientists creates something amazing, and the next group of scientists develop it into something even greater. So this is why 'Diabetes Week' is so important in celebrating all that's been achieved so far for diabetes, but also in supporting all that is soon to be discovered by scientists in the future.